Looking for the best mosquito fuel for mosquitoes in 2019? ​Tiki torches do more than just setting the mood for outdoor dining. ​With the right fuel, they also help keep those blood-sucking pests at bay so that you can truly enjoy the outdoors with your friends or family. Whether you like it or not, mosquitoes are most active looking for their next meal at the time we enjoy the glorious view of the sun as it sets in the west - dusk. And your choice of fuel for your tiki torch can help you avoid being an easy target for these blood thirst pests. ​What is a Tiki Torch? Should You Use Citronella Oil as Tiki Torch Fuel? Should You Use Eucalyptus Oil as Tiki Torch Fuel? How to Use Your Tiki Torch? The Tiki Torch is a special type of stationary light source often used outdoors for decorative purposes. This outdoor aesthetic is inspired by the bamboo torch of the Tiki culture. It now comes in various designs and shapes to match different outdoor activities such as dinner with family and friends in the garden or a relaxing sunset cocktail on the patio. The Tiki Torch is capable of improving the mood or ambience of a particular setting which makes it extremely popular among outdoor enthusiasts and romantics alike. As much as you want to enjoy your moment of tranquility in your backyard, mosquitoes can potentially ruin everything with just a single bite. With the right fuel, the Tiki Torch can do much more than just illuminate your al fresco dinner. Nowadays, Tiki Torches are increasingly becoming popular as effective mosquito repellents. For bug protection, tiki torches are equipped with specially formulated types of fuel which have been proven effective to drive away various insects especially mosquitoes. ​The Tiki Torch industry has grown dramatically due its increasing demand and popularity. Today's online market presents a wide array of choices for those who wish to add a tropical touch in their backyard's ambience. They come in different designs, styles, and sizes. ​You can either go for the traditional "Luau" inspired bamboo torch for your Hawaiian parties or the resin jar type lamps for a more subtle touch. ​Tiki torches are basically meant to improve the ambience of the space concerned. And what better way to secure a tiki torch that best appeals to your senses than to make your own. DIY Tiki Torches are economical, easy to make, and your imagination is your only limit. Some of the most popular materials used for DIY Tiki Torches are mason jars and different types of recycled glass bottles such as wine and whiskey. Citronella oil is one of the most basic components of Tiki Torch fuels used for repelling insects, particularly mosquitoes. The oil is extracted from the leaves and stem of a very popular Asian culinary herb Cymbopogon, commonly known as Lemongrass. It can be used on a wide array of beef, pork, fish, and poultry recipes providing a delicately complex citrus flavor. Apart from its culinary applications, Citronella oil is used to treat various types of health problem. Consumed as tea, Citronella oil promotes relaxation while fighting bacteria and improving digestive health. Citronella oil has long been proven effective in driving away blood thirsty mosquitoes and other common types of backyard bugs. It works through its powerful citrus aroma that disrupts the mosquito's ability to identify the scents that are critical in locating its targets. And since it is plant-based, the essential oil is friendly to human health as verified by the Environmental Protection Agency. Citronella oil is primarily composed of citronellol, citronellal, and geraniol. Because of the oil's anti-fungal, anti-microbial, anti-inflammatory, and insect repellent properties, Citronella comes in different forms of household products such as candles, soaps, sprays, and lotions. Its effectiveness however as mosquito repellent is limited only within 30-60 minutes. ​The above-mentioned chemicals that mainly comprise the Citronella oil are often used in cosmetics and perfumery. Its pleasant and soothing scent makes it a suitable essential for aromatherapy. It is an effective relaxant and can help people with insomnia secure better sleeps. ​Eucalyptus is a division of a wide variety of big flowering trees. They are commonly found in tropical and temperate countries such as Australia, Indonesia, New Guinea, Philippines, Americas, Europe, and Africa. Ecualyptus is considered as a fast growing tree and is an abundant source of another essential oil which also offers a number of health benefits. Extracted from the leaves of a Eucalyptus tree, Eucalyptus essential oil is a common and popular ingredient in different aspects of the human life. The oil is acquired by steam-distilling the leaves of the tree. The essential oil offers a cool, sweet, and refreshing scent making it very effective in relieving different symptoms of cold and cough. Like the Citronella oil, Eucalyptus oil also possesses anti-microbial, anti-inflammatory, and anti-fungal properties. It's sweet scent makes it a favorite addition on different cuisines to improve flavor. Can Eucalyptus be used as mosquito repellent? The strong cool scent of eucalyptus oil makes it an effective odor remover and this efficiently covers the scent that human body naturally gives off. This "cover up" help hide you from mosquitoes and their senses so they can not locate their next meal. It is also an effective insecticide to be used in eliminating ticks and mites as registered by the US EPA. Whether or not it's your first time to using Tiki Torches for your backyard escapades with your friends or family, it is imperative that you know how to properly use and maintain them. Tiki Torches are very nice outdoor companions and they can do more than just improve the mood of your garden barbecues and cocktail parties. Tiki Torches are a great way to warm up a backyard and keep the mosquitoes away. However, bear in mind that fire is still fire and safety should always be your top concern. There should be some limitations and guidelines that must be strictly observed in setting up your Tiki Torches in order to avoid any horrifying tiki torch incident from happening. As much as possible, refrain from placing your torches along branches or under any tree in your garden. Keep your torches at least 6 feet away from your home's structures or from any highly flammable materials that can be found in your yard or garden. Check out the below video for same tiki torch safety tips. You can use stakes to stabilize the torch and securely bury its bottom end at least 10 inches into the ground. If you are planning in using more than two torches, try placing them at least 8 feet apart. If possible, buy fuel that comes with a pour spout. Otherwise, use a funnel to avoid spills. It is also important to observe wick height. Ideal wick exposure should be no more than 1/4 of an inch to effectively produce a charming light with less soot. When it's time to call it a day, extinguish the fire from your torch using a snuffer cap (usually included in your torch package). Tiki Torches are not like your ordinary birthday candles and a snuffer cap is needed to put the light out. To do this, gently cover the wick of the torch with the snuffer cap until the flame is completely out. Re-expose the wick and give it a minute or two to cool off before you place the snuffer cap back over it. With most tiki torch fuels being made up of is a highly flammable material as well as containing dangerous hydrocarbons that if ingested could cause serious lung issues. When you buy fuel, ensure it is kept in a safe and secure place away from children. 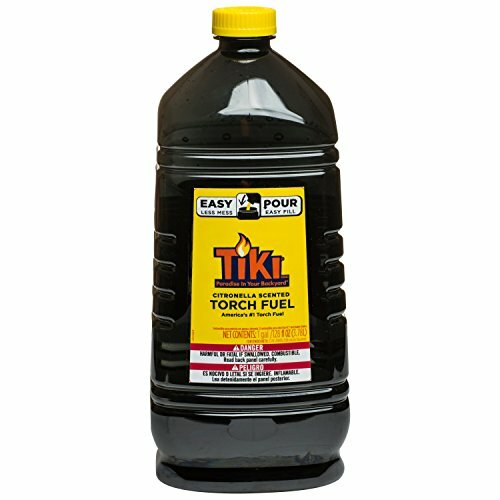 Tiki torch fuel containers look a lot like popular juice containers. See the below video to get a sense of what we mean. 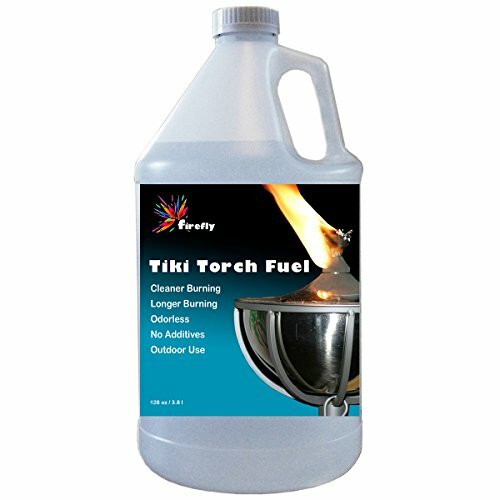 The Firefly Tiki Torch fuel is a eucalyptus oil base specially formulated to provide clean and odorless flame with dramatically minimized smoke. It runs 30% - 50% longer compared to other brands of torch fuel which makes it an ideal choice for those who are trying to make ends meet. Just make sure that you keep the wick of your torch flushed with the vessel's collar to maximize the fuel's offered benefits. It comes with high quality PET bottle paired with child-proof cap for added safety. This mosquito repellent tiki torch fuel can be acquired with citronella oil or eucalyptus oil. This is a specially formulated Tiki Torch fuel as it has a mix of citronella oil and cedar for improved efficiency in repelling mosquitoes. You also don't have to trouble yourself in securing a funnel because its bottle comes with an easy pour system for spill-free refills. The Tiki BiteFighter is also an economical choice. A single 100 oz bottle can fill up eight 12 oz size vessels with up to 5 hours of burn time. It is recommended to pair this fuel with Tiki Brand wide mouth canisters for easy no mess refilling experience. 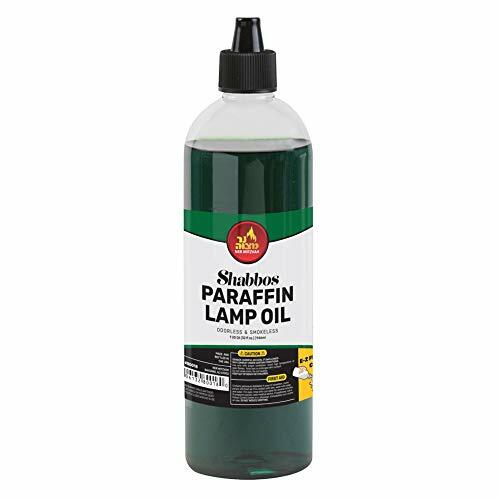 If you are looking for a tiki torch fuel that you can conveniently use outdoors and indoors, then this paraffin lamp oil could be the perfect solution for you. It offers smokeless and odorless flame which makes it ideal to use inside the house. It comes with an easy-fill cap to efficiently assist mess-free refills. The oil is also effective to use with all types of wick. Its paraffin oil is refined and distilled which makes it capable of producing powerful light for all occasions. Ner Mitzvah also comes in five beautiful colors so you can come up with different types of calming atmosphere for various affairs. ​Apart from keeping mosquitoes at bay, Eucalyptus oil is also an effective remedy for those suffering from respiratory problems. It also gives off cool and refreshing scent. Firefly Clean Fuel comes with Eucalyptus Essential Oil essence for mosquito-free backyard dinner with a twist of aromatherapy. It burns longer compared to paraffin oil and offers clean and smokeless flame. Just make sure that you use a new wick on its first use to make sure you start off smoke-free. 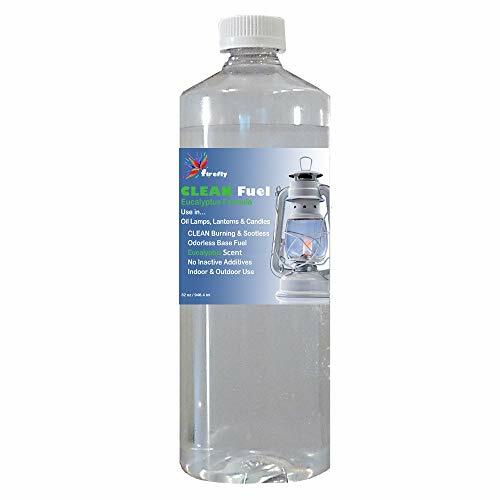 Apart from tiki torches, you can also use this fuel on oil candles, lamps, and lanterns. You must however, avoid using this on wicks with larger than 3.6mm. 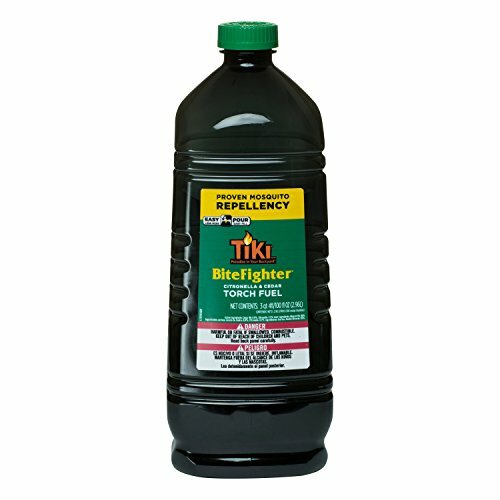 The Tiki Brand is a trusted name in the industry of mosquito repellent tiki torch fuel. And it has another trick up its sleeve before this list is concluded - the Tiki Citronella Scented Torch Fuel. Notorious for repelling mosquitoes and other types of garden bugs, the Citronella Oil is a potent addition for this tiki torch fuel. Like its relative bottles in the Tiki empire, its container comes with an easy-pour system for minimized chances of spills. Its citronella grass scent is effective in keeping you from becoming an easy target for blood-thirsty mosquitoes. ​Tiki Torch fuel products can have different levels of efficiency under various environmental conditions. Some may come with additional usage instructions but works perfectly when followed through. The good thing about this list is you are presented with a choice as to whether you want to go with pure and odorless or with a punch of citronella, eucalyptus, and cedar. Nonetheless, my best pick would be the Tiki BiteFighter Torch Fuel. Compared to the rest of the entries in this list, this fuel is specially blended with cedar for improved mosquito repelling property. It has an easy pour system and smells just fine.